Taking place at the Amfora Hvar Grand Beach Resort, Ultra Beach Hvar boasts an idyllic setting with views of the Adriatic drenched in the warm glow of the Croatian Sun. With a predicted 5,000 revellers and international DJs Fedde Le Grand, Nicky Romero, Oliver Heldens, Jonas Blue and San Holo providing the soundtrack, this may well be the most anticipated edition yet. This year the pool party will start earlier than ever before, running from 1pm until 10pm with nine hours of nonstop music. At 11pm, after the sun has set on ULTRA Beach Hvar, the official after party, Resistance Hvar, will take place at Carpe Diem Beach Club just a short boat ride off the coast of Hvar on the Pakleni Islands. VIP Ultra Beach Ticket holders are granted free entry to the after party, while other partygoers will need to pay at the door. This is the first time a Resistnace event has been held on the island. Ultra Beach Hvar is a part of the weeklong Destination Ultra 2018 experience running from 5-11 July. 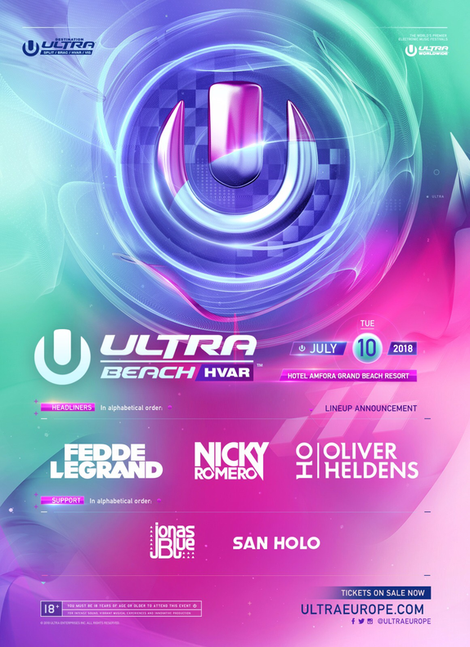 The experience spans the three picturesque Croatian islands of Brac, Hvar and Vis, as well as the mainland for the flagship ULTRA Europe event in Split.